Lately I've been waking up thinking I'm not in my own room, but in Hollywood instead... In a small bed with pilled madras sheets, birds singing against the unabating whisper that comes from being wedged between Santa Monica Blvd. and Sunset, the stifling smell of the neighbor's guava trees, and the sunlight flooding like a sustained Polaroid flash, throwing a glare on the hardwood to make you wish for lead goggles. It's odd that I'd be confused, since the dark 6 AM quiet that I wake up in now bears no resemblance. Maybe I'm craving those lazy Hollywood mornings when I was hiding out from the street-cleaning meter maids, killing hours making breakfast and reading the Economist alone in someone else's kitchen. Or maybe I'm craving the companionship that allowed me to wake up in someone else's apartment. However, now in my own bed, I can make a snow angel (eye-mask still on). It's a relief to brush my arm over the smooth, cool sheets on the other side of my bed, immaculate since no one dragged wrinkles through them rolling out on the way to work. I didn't think much of it at the time, but those Indian sheets slightly scratching my skin developed into a mildly irritating compromise. Now, when I've shaken off the disorientation of sleep, I appreciate what a comfort it is to sleep on a pillow I picked for myself. I have never made peanut butter cookies for myself. I make them all the time. I'm pretty fond of cookies, PB are just not my favorite (it works out: I'm not tempted to eat the whole batch before they make it to their destination). But my peanut butter cookies were someone else's favorite--so much that I'd ship them as a forget-me-not. There's something nice about making a thing for someone else, even when the recipient isn't there. There's something warm about the routine of it and where your mind goes when you're creaming the butter, rolling in sugar, dropping by rounded spoonful. Especially these days where most things I do are for me, there's a tenderness in creating something with the spirit of a gift. As I was walking with a tupperware full of my last batch of these, a woman in her parked car rolled down her window to ask what I'd made. Turns out peanut butter chocolate are her favorite but she "doesn't know anyone who makes them anymore". Hopefully, a couple cookies from a passerby improved her evening. adapted from Rose's Christmas Cookies:"Peanut Butter and Jelly Jewels"
I've been making this recipe for 7 or 8 years. There could be a better one but it doesn't feel right to switch. 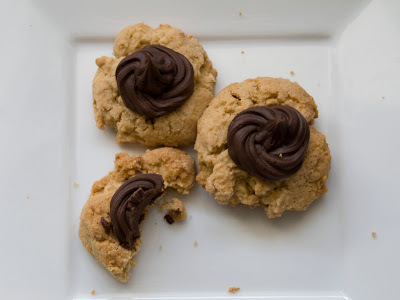 It makes a sandy cookie rather than a chewy one and is good even without the chocolate. Preheat oven to 375 ° F and place oven racks in top and bottom third. Sift flour, salt, baking soda, and spices together in a small bowl. Set aside. Mix sugars together. Beat sugars with butter until lightened. Beat in peanut butter until creamy. Add in egg and vanilla and beat until just incorporated. Switch to a spoon if you were using an electric beater and slowly mix in the dry mixture to the PB one, until just incorporated. Refrigerate the dough at least an hour (and up to overnight). Place some granulated sugar and a little cinnamon in a shallow bowl. Remove dough from fridge. Scoop dough by rounded teaspoonful and roll through the sugar. Place balls 1.5 inches apart on an ungreased cookie sheet. Using your finger, or the end of a wooden spoon, make a deep well in the center of each ball. Bake for 10-12 minutes, rotating oven racks halfway. Cool on sheets for a couple minutes then transfer to cooling racks to cool completely. You can deepen the wells while the cookies are still warm. Melt the chocolate in a double-boiler, stirring constantly until it is smooth (since I'm neurotic about burning chocolate, I remove it from the heat before it is completely melted and use the residual heat to finish). Let it cool very slightly, then whisk in the softened butter until just mixed in. Use a pastry bag and tip, a cut-off Ziploc, or a spoon to fill the centers of the cookies. Allow the filled cookies to set until firm.